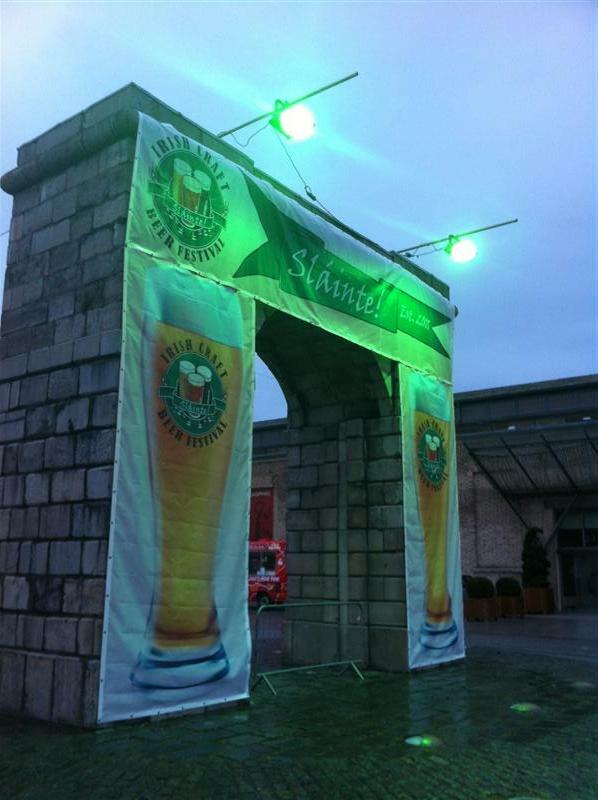 This St Patrick's festival weekend saw the start of a new craft beer festival in Dublin, and there is no better time for a beer festival than the St Patrick's festival weekend, well except in the summer when it's warmer. It ran from Thursday until today. The entrance is an impressive arch and behind it you walk down a ramp to the festival area below. Outside you find vendors selling various types of food, though the hot dogs, especially the large bratwurst type are especially good. Be warned, the large ones are €6 I believe. The regular size is €3. There is one bar outside which has a few taps of kegged beer, namely O'Hara's beers and one cask engine. I believe it had Leann Folláin at some point but when I was there they had what I considered to be the beer of the festival from the Hilden brewery. Twisted Hop is a real hop juice type of pale ale. It is absolutely beautiful and when I was done at the festival, I was delighted to find it on cask at the Black Sheep (which I will write about soon). The outside bar is also usually quiet so a secret weapon when the main bar is packed. It also contains some great beer so make sure you visit it. I arrived before 7pm which meant it was free in. By seven it was very busy and I would say this is one of the reasons for a number of complaints on the first night. People were waiting nearly 30 minutes to get served at this point. The office crowd were getting off work and coming in for a few but by about 7:45 it had died off enough that some of the bar staff had no one to serve at times so getting a drink was no problem, though space in the tent was at a premium. There was live music and to be honest I rather enjoyed it. They played covers and did a very respectable job of a Mumford & Son song or two. There were a number of complaints on the Thursday night, partly was how long it took to get served but also was the bar staff not being experienced enough and pouring half a beer of head or refusing to serve half pints. I am guessing that words were had because there was none of that on Friday. In fact I saw people being served half pints and more importantly, I saw at least one very friendly bar man not only talk to people about the beer, but offered tastes before someone took the plunge and this is very important at a beer festival. Perhaps not practical at the end of work rush but once things quit down a little then it should even be encouraged because at the end of the day, this sort of festival is about introducing people to beer that has been carefully craft brewed by small independent brewery and while the bottom line is important, it's their livelihood after all, what is more important is the quality of the beer and ensuring people enjoy it. There are certain things that perhaps could be done a little better. Having the seating, bars and band in the one tent was a little bit silly as navigating to the bar was an obstacle course in itself. I would reckon that having a bar tent for just serving the beer and then a separate seating tent, but adjoining the bar would be a better idea. 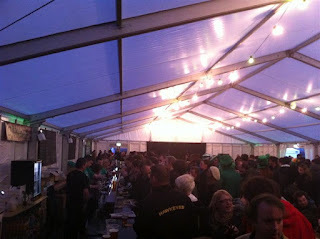 There was plenty of space outside but being a cold and wet Friday evening, that was far less popular. One of the problems with Thursday was the €10 cover charge which only entitled you to get in. Originally a souvenir pint glass was to be provided but health and safety said no to that at the last minute so for Friday I believe you were being given a free pint voucher so you were only really paying €5 in and I think that is worth it. For some reason, on leaving the beer tent, you were stamped and then on entering again you had to show your stamp? I am not sure of the purpose of this because what if you had only arrived and wanted a drink, you would not have a stamp. Perhaps it was only at paying time and those who paid got stamped coming in or some other kind of token but I still don't understand the purpose that serves. Negatives are in the minority though because I really enjoyed myself and so did the thousands of others around me from what I could tell. Anyway I wanted to get this post published today because the festival is on today from noon. Even better is that it's an absolutely stunning day out there today and great weather for a beer festival. Tomorrow it's free all day so another good reason to go. Don't forget, it's €10 in today but that includes a free pint of your choice!